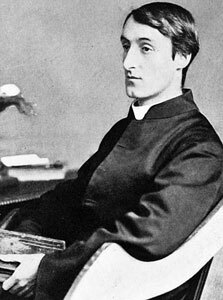 Gerard Manley Hopkins (1844-1889) was an English Jesuit priest and poet who created an entirely new poetic style but whose poetry remained largely unpublished and unknown in his short lifetime – he was only 44 when he died. Hopkins poems are extremely musical, embracing alliteration, assonance, internal-rhyme and sprung rhythm. He was obsessed with the idea that everything in the universe has a unique essence (inscape) and many of his poems attempt to capture the remarkable energy (instress) at the core of all things. Reading his ‘bright sonnets’ is a really fun experience; they are filled with light and energy and genuine excitement. His poetry also has a very modern feel to it and his interest in protecting the environment led some to label him the father of the green movement. His ‘terrible sonnets’ exist at the other extreme, offering a frightening insight into the torment of depression and mental illness. Throughout his work we see Hopkins both celebrate and question his religious faith and his struggle to overcome his doubts and his despair is a truly fascinating and heartbreaking element of his poetry.